Well, HELLO, my friends! My, my...it has been a while. ...sorry about that. my husband and I are still married!! (and still very much happily married). It might seem silly to some that I had to post that, but you'd be surprised with how many emails I've received from concerned readers wondering where I went? if I'm okay? if my marriage is okay? if I want help posting? the list goes on. So, to you concerned readers, a sincere Thank you! Your concern was really thoughtful and touching. I kinda had to just up and leave the blog for a while with so many things going on in my life...I didn't want to do a "goodbye" post because... honestly, I HATE goodbyes... AND I wasn't ever sure I was really done for good. So, by leaving it open, the possibility was still there. With that said, it's no secret that Love Actually is more an archive of ideas than an active posting site these days... I intend to keep it that way for now. (until I decide to come back and make something more of it!) The ideas are still free for you to use for personal use, unless written permission is given from me. I'm expanding my blogging vision to include a little more of what I'm pursuing besides just the lovey-dovey stuff! ....one for a fun Anniversary Date/Gift idea! Yes you right.Style,design etc are the shining of life.Some nice necklaces for the appropriation of your nice post. Very happy to see you blogging again (I was worried - glad all is well!) Super excited to check out your new blog! 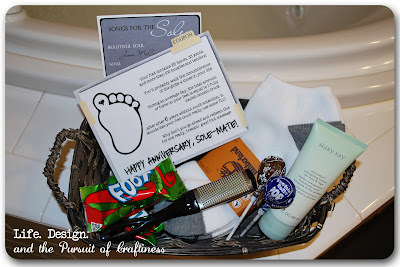 I love the creativity and the meaningfulness behind custom gift baskets! When done well they are the greatest presents ever! I love your blog!! BEST GIFT IDEAS FOR HUSBAND ON VALENTINE DAY..